I love trying new products. Especially products that are new to the market. 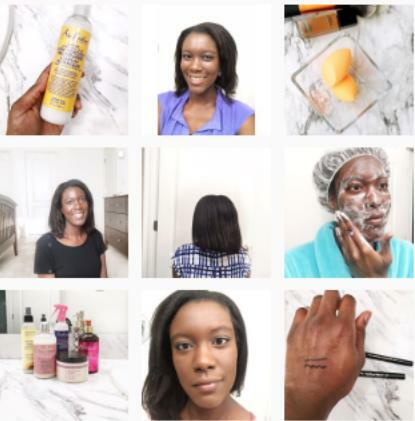 So I was excited to try out two products in the SheaMoisture Manuka Honey and Mafura Oil line. One was the shampoo the other the Intensive Hydration Masque. The two times I used the SheaMoisture Manuka Honey & Mafura Oil Intensive Hydration Masque my hair didn't like it or respond well to it (see my first impressions video). The first time I used it per the instructions applying it to clean, wet hair. The second time I used it on dry hair as a pre-poo like I do my go-to deep conditioner. Just like the shampoo it messed with my moisture levels so no matter how much moisturizing and sealing I did during the week my hair felt dry. Same as the shampoo the smell of the hair masque is rich and musky. The texture is thick like a putty. I could hold the container upside down and nothing fell out. It also feels dry and has no slip. The SheaMoisture Manuka Honey & Mafura Oil Intensive Hydration Masque will not be making it's way into my regimen and I wouldn't recommend it. In fact I haven't touched it since my second use of it. It's not moisturizing for my hair and seems to draw out or block moisture. "This intense conditioning deep treatment infuses hair with a powerful dose of moisture and nutrients. Certified organic Shea Butter, Honey, Mafura and Baobab Oils are blended with antioxidant-rich African Rock Fig to restore and lock in moisture. Smoothes and fortifies follicles for stronger, healthier frizz-free hair." "Water (Aqua), Cetyl Alcohol, Cocos Nucifera (Coconut) Oil, Behentrimonium Methosulfate, Butyrospermum Parkii (Shea) Butter*, Glycerin (Vegetable), Stearyl Alcohol, Behentrimonium Chloride, Panthenol, Trichilia Emetica (Mafura) Seed Oil, Honey, Hydrolyzed Rice Protein, Fragrance (Essential Oil Blend), Adansonia Digitata (Baobab) Seed Oil, Cetrimonium Chloride, Persea Gratissma (Avocado) Oil, Ficus (Fig) Extract, Mangifera Indica (Mango) Seed Butter *, Tocopherol, Aloe Barbadensis Leaf Extract, Caprylhydroxamic Acid, Caprylyl Glycol, Butylene Glycol Butter *"
"Section clean, wet hair. Apply generously. Use a wide tooth comb to distribute evenly from root to ends. Leave in for 5 minutes. Rinse thoroughly. For extra conditioning , cover hair with a plastic cap. Apply moderate heat for up to 30 minutes. When using a steamer do not cover hair. Moist heat will add to masque's hydration." Have you used the SheaMoisture Manuka Honey & Mafura Oil Intensive Hydration Masque? Awww!! That stinks chica! I've found that SM products are totally hit or miss and NOTHING in between for my hair. They really are hit or miss. I'm finding that my hair prefers the SheaMoisture shampoos over the conditioners. Interesting! So many of the SM products are so good, I'm shocked with the thick, creamy consistency of this conditioner that it was anything less than super moisturizing! Great review....I have zero curiosity about this item now, lol! The conditioner is thick, but I wouldn't call it creamy. That may be why my hair didn't care for it. The Eden BodyWorks DC I use is very creamy and my hair loves it. I'm so late responding to this post but just ran across it. I couldn't agree more! My relaxed hair didn't respond to the SheaMoisture Manuka Honey & Mafura Oil Intensive Hydration Masque either. I was so disappointed. I had such high hopes considering the texture of the masque. The only thing I loved was the smell. It was disappointing. I ended up giving the masque to my mom and when I visited her last Christmas she still had some left so I tried it again. It still didn't work, but the result wasn't as bad as it was the first time. Do you use any of the other SheaMoisture masques?